Are you stuffed from all the Thanksgiving yummies? 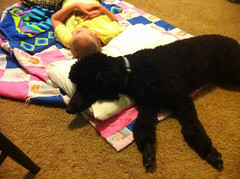 Max had a great long weekend off of school and therapies. Since Thanksgiving is not all about the food for Max, we try to make it fun in other ways. Thanksgiving for Max means getting to go to the zoo! We love to go to the zoo on Thanksgiving and Christmas because the crowds are very low, and we can take Max into the buildings. 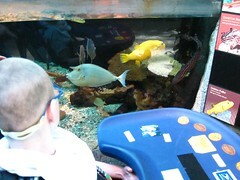 He especially loves to see the lions, and then over to see the tropical animals inside. Abbey enjoys the elephants most, and we all like the apes, but skipped them this year. 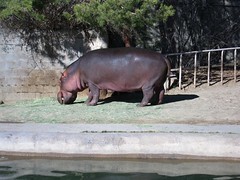 We all thought it was fun to watch the hippos out of their water while they ate! 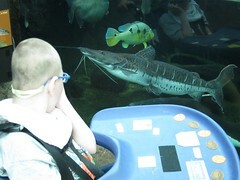 I think the tropics building is better for Max than our big Downtown Aquarium. Not nearly as crowded, and just long enough to keep his attention and not overwhelm him. 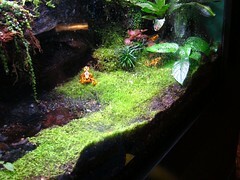 And, they have yellow frogs, fish, and snakes. 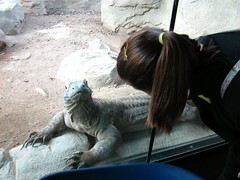 Plus this monster, who took a special liking to Abbey. We had lunch at our favorite Middle Eastern restaurant after our fun at the zoo. Then back home to get the Thanksgiving meal finished cooking for the evening meal. I made way too much food, but not too much for leftovers as it turns out, so that was a nice surprise. We had a great time with my sister and her family. Friday after Thanksgiving, George got his first haircut by Steve. The breeder who we got George from was gracious enough to teach Steve how to clip him so we don't have to fuss with getting him to a groomer once a month. I think George looks great! He's cut shorter, so brushing isn't as much work for me now! And, he was more than happy to be back with his boy once he got home. 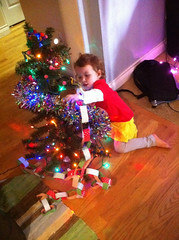 Addie helped decorate the little schoolroom tree for Max. She was a great help! 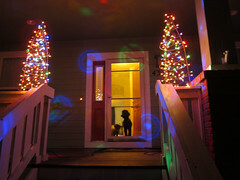 And we got the outside decorated. The dogs seem to like it. 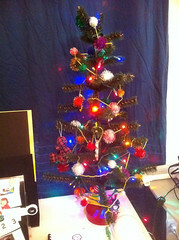 By the way, this is our 300th post on MonsterMax.org! We'll end this season of Thanksgiving, by saying that we're thankful for our friends, family, and fans of Max every day of the year for following our son's story, and cheering him and all of us on. Thank you for reading, clicking on the ads, donating, and spreading the word! wasrionoLooks like a great Thanksgiving--I love the zoo. Great pics. Addie is really growing fast.